The ultimate winter getaway! 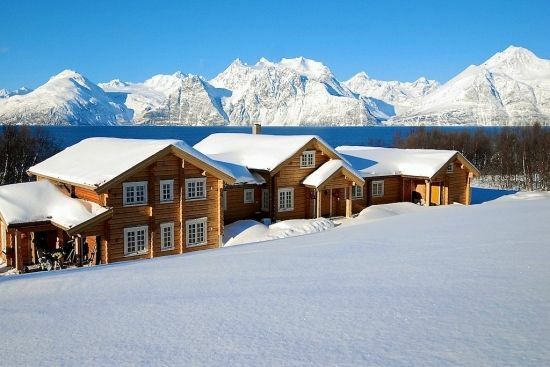 Lyngen Lodge, set high above the Arctic Circle in Northern Norway, is an intimate, mountain lodge in a gorgeous setting. This 8-room lodge provides full board accommodations with gourmet meals made from local produce and a focus on Norwegian coastal culture. Though summer activities are available (fishing, hiking, sailing, sea safari, horseback riding, etc. ), we were particularly impressed with their winter activities. Enjoy dog sledding, snowshoeing, ice fishing, cross-country skiing, Northern Lights exploration, and the unique boat skiing. They have a specially designed boat that picks you up right at the lodge, board with your ski boots on, then disembark directly from the bow on beaches, headlands, and piers for your skiing on untracked snow high above the fjords. A true TrailblazerGirl adventure!